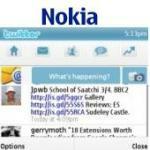 Nokia has now added support for Twitter in its Messaging for social Networks beta Application. Nokia claims that it will make tweeting even more convenient from the homescreen of your Nokia handset. Right now this is available only for Nokia N97, Nokia N97 Mini, and Nokia 5800 device. Nokia will support more device for this app in future. As of now only Facebook and twitter can be accessed via this app however We are introducing the beta with Facebook and Twitter accessed via this app, however Nokia plans to introduce additional social networking communities over time.